'A family occasion' was how the retirement thanksgiving service for General John Larsson and Freda Larsson was described. The low-key meeting at International Headquarters was attended by the international leaders' friends and relatives as well as members of their IHQ family – the staff who work on the building. The Larssons' retirement certificates were presented by Retired General John Gowans, who paid warm tribute to his successor's gifts. Commissioner Gis�le Gowans read words of Scripture and added words of tribute of her own. Contributions from Commissioner Larsson's sister, Major Brenda Sterling – on a visit home from her appointment in Zimbabwe – and General Larsson's sister, Lieut-Colonel Miriam Frederiksen (IHQ) gave insights to the international leaders' backgrounds. Songster Leader Susan Turner, Commissioner Larsson's sister-in-law, gave a poignant link to the past with the vocal solo 'What Shall I Ask of You?'. The song, from the Gowans and Larsson musical Hosea, received its first public performance on 5 July 1969, at the Larssons' wedding – sung by Susan Turner. Commissioner Denis Hunter drew proceedings to a close with a benediction before asking the General to accompany the congregation on the keyboard in singing the General's arrangement of the doxology. It was an appropriate way to bring to a conclusion almost 50 years of active officer-service. The meeting was presided over by the Chief of the Staff, Commissioner Israel L. Gaither. He and Commissioner Eva D. Gaither were given their own special farewell meeting at IHQ the week before. 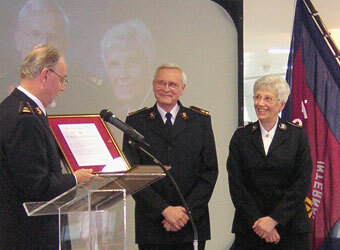 On 1 May the Gaithers will take over as national leaders of The Salvation Army in the USA.